The purpose of this study was to examine the differences in Ground Reaction Forces (GRF) between standing and running soccer throw-in. Six male amateur soccer players volunteered participated in the current study. All data are expressed as mean±SD. The longer distance was observed in the running throw-in than the standing throw-in. The standing throw-in showed higher values at Vertical (Fz) GRF during back swing, forward swing and release phases. However, that of the running throw-in during follow through phase was higher than that of the standing throw-in. As a result, the longer throwing distance in the running throw-in can be explained that the players spend shorter time in all phases at running throw-in than they did in the standing throw-in. This might causes efficient energy transfer from proximal to distal segment during the running throw-in. Chang, J. (1979). The biomechanical analysis of the selected soccer throw-in techniques. Asian Journal of Physical Education, 2, 254-60. Carnys, G. De. and Lees, A. (2007). The effects of strength training and practice on soccer throw-in performance. In T. Reilly and F. Korkusuz (Eds. ), Science and Football VI (pp. 16-20). London: Routledge. Cerrah, A.O., Onarici Gungor, E. and Yılmaz, İ. (2012). Relationship between isokinetic strength parameters and soccer throw-in performance. Isokinetics and Exercise Science (Accepted). Cerrah, A.O., Onarici Gungor, E., Soylu A.R., Ertan H., Lees A. and Bayrak C. (2011). Muscular activation patterns during the soccer in-step kick. Isokinetics and Exercise Science, 19, 181- 190. Kerwin, D. G. and Bray, K. (2004). Quantifying the trajectory of the long soccer throw-in. In M. Hubbard, R. D. Mehta and J. M. Pallis (Eds. ), The Engineering of Sport 5 (Vol. 1) (pp 63– 69). Sheffield: International Sports Engineering Association. Linthorne, N.P. and Everett, D.J. (2006). Release angle for attaining maximum distance in the soccer throw-in, Sports Bimechanics, 5, 243-260. Lees, A., Kemp, M. and Moura, F.A. (2005). Biomechanical analysis of the soccer throw-in with a particular focus on the upper limb motion. In T. Reilly, J. Cabri and D. Araujo (Eds. ), Science and Football V (pp 89-94). Lisbon: Faculty of Human Kinetics. Levendusky, T.A., Clinger, C.D., Miller, R.E. and Armstrong, C.W. (1985). Soccer throw-in kinematics, In J. Terauds and J.N. Barham (Eds. ), Biomechanics in Sports II (pp 258-268). California: Del Mar. Messier, S. P. and Brody, M.A. (1986). Mechanics of translation and rotation during conventional and handspring soccer throw-ins. International Journal of Sport Biomechanics, 2, 301–315. Kollath, E. and Schwirtz, A. (1988).Biomechanical analysis of the soccer throw-in. In T. Reilly, A. Lees, K. Davidsi and W.J. Murpht (Eds. ), Science and Football (pp 460-67). New York: EandFN Spon. ISNAD Cerrah, Ali , Şimşek, Deniz , Ertan, Hayri . "The Evaluation of Ground Reaction Forces During Two Different Soccer Throw-In Techniques: A Preliminary Study". 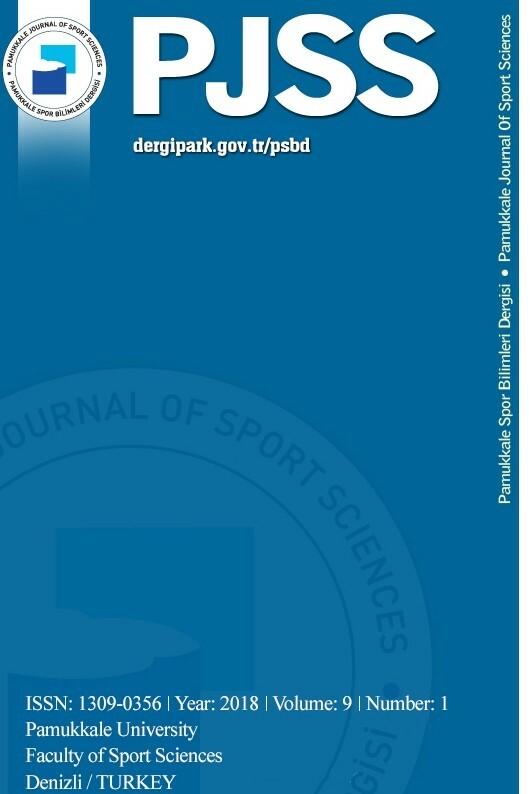 Pamukkale Journal of Sport Sciences 5 / 1 (January 2014): 106-112.